Courthouse (Calle Fuencarral 81, 28004 Madrid). 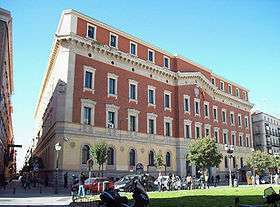 In Spain, the Tribunal de Cuentas (Court of Auditors) is the supreme governmental accounting agency, responsible of the comptrolling of the public accounts of Spain and the auditing of the accountancy of the political parties, in accordance with the Constitution and its Organic Law. The equivalent of the Court of Auditors in Latin America is the General Department of the Comptroller of the Republic. external audit of the public sector's economic and financial activities. responsibility for procedures involving those persons who hold offices that involve the management of wealth or of public assets. In 1974 the Court hosted VIII INCOSAI, the eighth triennial convention of the International Organization of Supreme Audit Institutions. The decisions of the Court of Auditors are made in accordance with the Court's Operating Law. Those decisions are subject to appeal and review before the Supreme Court. The current Chairperson (Presidente del Tribunal de Cuentas) is MANUEL NÚÑEZ PÉREZ (Real Decreto 1539/2007, de 23 de noviembre, BOE 26.11.07 (Royal Decree 1539 / 2007 of 23 November, Spanish Government Gazette of 26.11.07)).